Basingstoke shopping centre, Festival Place is inviting shoppers to meet Po the Panda on Wednesday 17th February 2016 from 11am until 5pm. The famous Panda will be outside Marks & Spencer at 11:00 – 11:30 / 12:00 – 12:30 / 13:00 – 13:30 / 14:30 – 15:00 / 15:30 – 16:00 / 16:30 – 17:00. The exciting meet and greet comes as one of the most successful animated franchises in the world returns with its biggest comedy adventure yet, KUNG FU PANDA 3. The fun new film sees Po’s long-lost panda father suddenly reappear, reuniting the duo as they travel to a secret panda paradise to meet scores of hilarious new panda characters. But when the supernatural villain Kai begins to sweep across China defeating all the kung fu masters, Po must do the impossible; learn to train a village full of his fun-loving, clumsy brethren to become the ultimate band of Kung Fu Pandas! 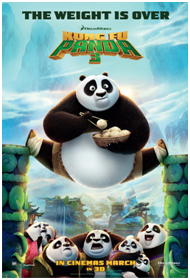 KUNG FU PANDA 3 is released in cinemas on 30 March 2016. To keep up to date with details of the meet and greet and other events at Festival Place visit www.festivalplace.co.uk or find them on Facebook, Twitter and Instagram. ← February Half Term 2016: Ideas and Suggestions!